MAOI diet information on the Internet can be very confusing for someone just starting one of these antidepressant medications. Monoamine oxidase inhibitors (MAOIs) are medications that inhibit the action of the enzyme monoamine oxidase. breaks down the three chemicals in the brain which may be deficient in people with depression: norepinephrine, serotonin, and dopamine. Almost all antidepressants in use today work, at least in part, by boosting one or more of these compounds in the brain. Monoamine oxidase inhibitors boost all three, which may be why they can be effective where other medications have not worked. Unfortunately, monoamine oxidase plays a key role in preventing overly high levels of norepinephrine, which can, in turn, lead to the constriction of blood vessels and the development of severe hypertension. The main risk of this is in someone who is on a monoamine oxidase inhibitor and eats a food with a high content of tyramine. Tyramine is an amino acid which is present in foods mostly because of the action of certain bacteria on protein. Thus tyramine containing foods are primarily those where the food is exposed to these bacteria, which are present in the air. Examples of these foods are: some cheeses (notably Stilton), air cured sausages and meats (salami and certain hams, like prosciutto) and some fermented soybean products (some soy sauces). In order for there to be a significant risk of a hypertensive reaction, the food has to contain more than 6 to 8 mg of tyramine. All of this seems pretty straightforward. However, in the 1980s and into the 1990s, there were case reports of hypertensive reactions associated with a very long and complicated list of foods. The problem was that these case reports got published without the author’s making any effort to verify that the foods actually contained tyramine. People not taking monoamine oxidase inhibitors can have hypertensive reactions spontaneously. Thus, if someone is taking a monoamine oxidase inhibitor and develops a hypertensive state, that may or may not be related to the ingestion of food. Case reports of hypertensive reactions to MAOIs became something of a fad. In the late 1990s, a number of experts in the treatment of depression began to be concerned that MAOIs were not getting prescribed in patients with severe and treatment refractory depression. They began to review the long lists of foods (lists of foods that were generated by simply searching for any case report of hypertension associated with an MAOI) that were to be found in “MAOI diets” (foods that people were told they should not take if they were on an MAOI). They went to the lab to see if these foods actually had tyramine in them and they discovered that many of the foods on these long lists did not actually have any tyramine. Almost 20 years later, there are still a number of lists circulating on the Internet that include foods without significant tyramine content. One of these lists is to be found on the University of Pittsburg Medical Center website (usually a source of useful information). 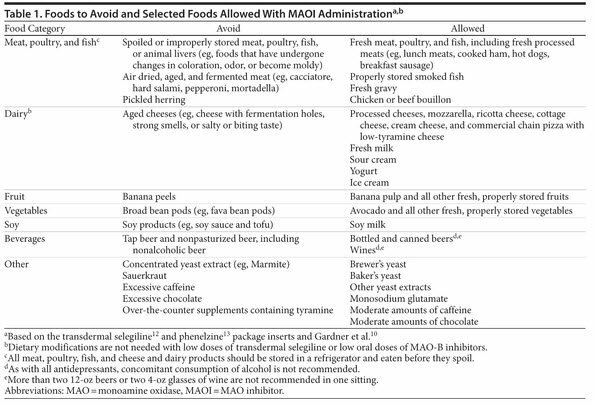 Glancing down the list I note that a number of the foods cited as “to be avoided” have been tested and found not to contain a high level of tyramine. And some of the material makes no sense just from inspection. Under the heading “Beverages” it says to avoid all alcoholic drinks, most especially beer and Chianti wine. 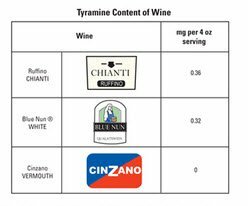 But take a look in the graph to the left (created by psychopharmacology expert Steve Stahl) and you will see that commercially available Chianti wines have essentially no tyramine content. Needless to say all of this can be pretty upsetting to someone just getting started on an MAOI. David Flockhart, from the Indiana University School of Medicine published an update in the 2012 edition of the Journal of Clinical Psychiatry with a very brief list of foods to avoid. Let’s take a look at that list. Recall that what mostly creates tyramine in food is the action of bacteria in the air on protein. Since this is also what leads to food spoilage, commercial producers of food in this country take a great deal of care to prevent it from happening. However small producers in other countries may not take the same care. Even this relatively short list contains a few things that don’t seem to make much sense. The classic one is banana peels. Who eats banana peels? It is a good starting place however and I like the fact that it contains information to help you judge whether or not a food is likely to be a risk (” cheese with fermentation holes, strong smells, or a salty or biting taste”) helps to clarify the process that makes certain cheeses a risk. “Dietary Restrictions and Drug Interactions With Monoamine Oxidase Inhibitors: An Update” J Clin Psychiatry 2012;73[suppl 1]:17–24.